We always start the journey with a qEEG brain map. A qEEG brain map provides the most accurate assessment of your brain function and how your brain affects your cognitive, emotional, social function & behavior. It allows us to “look inside” your brain and identify any areas of instability, over-stimulation and under-arousal which may lead to dysfunction, disease and pain. As soon as you schedule your qEEG brain map appointment, we will email you directions on how to access our patient portal and complete a physiological/metabolic, cognitive, emotional and social assessment. This represents your symptomatic baseline and will also be used to track your progress. During your treatments, we will use a progress tracker to rate your symptoms on a regular basis and compare them with this baseline. On your first visit, we will conduct a detailed and comprehensive consultation, discussing your condition and history, former treatments, your lifestyle and diet and evaluate whether Advanced Neurofeedback is a good fit for you. We will also collect your EEG data by recording electrical activity in your brain with our Electroencephalogram or EEG system. 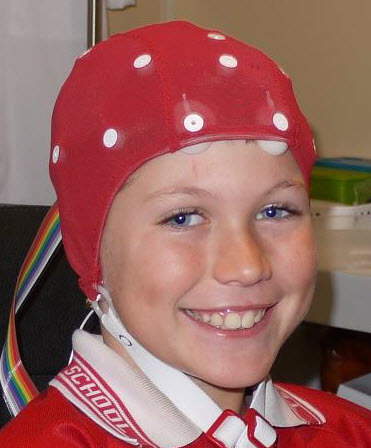 We place an EEG cap with built-in sensors on your head. Ear clips are attached to your ear lobes. We insert water soluble EEG gel in each of the sensors to ensure a good connection with your scalp and test the EEG readings. Subsequently, we record your EEG brainwaves of each of the different lobes of your brain and along the mid line. We record with eyes closed first and then with eyes open. For the eyes closed recording, patients need to be able to keep their eyes closed for one minute at a time. For young children or patients with sensory issues, it is advised to get patients used to this procedure before scheduling an appointment. Use a tight swimming cap and practice putting it on and leaving it on for 15 minutes before taking it off. Use clip-on earrings to get them used to the feeling of clips attached to their ear lobes. We also want you to be aware that the liquid gel will make a mess of your hair. So it’s best not to schedule any important appointments after this procedure. We upload your EEG data to a normative database, where your raw EEG data is processed and compared with peers within your age group and gender. This results in your qEEG or quantitative EEG brain map report. Your qEEG brain map includes an eyes closed and an eyes open report, a mid-line and sub-component analysis as well as a probability analysis of different issues. The brain map compares the results of your symptomatic assessments from step 1 with the issues found on the EEG and whether they align. Subsequently we will analyze your report, investigating the underlying causes of your cognitive, emotional and/or social issues. We also identify whether any underlying physiological or metabolic issues inhibit your brain function. We analyze your delta, theta, alpha & beta brain waves along the dimensions of magnitude, dominant frequency, connectivity & coherence, phase and asymmetry, in both relative and absolute measures. Based on what we find, we will develop your custom designed clinical protocol used during your brain training and decide whether you need an additional nutritional evaluation. On your next visit, we will explain the qEEG brain map report and the results of the analysis. We will discuss a custom designed clinical protocol specifically for you. The protocol is designed to correct dysfunctional brainwaves and correct areas of hypo- (under) or hyper- (over) stimulation in your brain. We will also recommend any applicable and necessary cognitive performance tests, based on the results of your qEEG brain map. These tests will be conducted before we start any treatment to establish a more objective symptomatic baseline. Future tests will be compared with this baseline to manage progress. We offer unlimited free computerized cognitive performance tests. After training & treatment, we take another sample of EEG data to compare a pre and post treatment map. This can show you the power of neuro-plasticity and the amazing changes your brain can make. My son has been diagnosed with autism at age 3. We have tried every type of therapy: ABA, OT, physical and speech. Despite the years of therapy, his speech hasn’t improved very much at all. Our son seemed absent and he could be impulsive and socially inappropriate. He struggled with sustained attention and gets in trouble at school. Our speech therapist referred us to the Jamieson Health Center. After the initial assessment and brain map, we knew so much more about our son. It finally started to make sense. After changing our diet, supplements and 2 neurofeedback sessions, we saw improvement in his speech. After 3 sessions, his teachers were noticing a difference in his focus and attention. It was like a miracle! Now, he has been at his second summer camp. He has friends and shows empathy. He can play ball games and is not afraid. He is not obsessed with certain things anymore. And we can understand everything he says now. He is even using difficult words! His reading comprehension is much better and I could go on and on. We are so thankful to have found the Jamieson Health Center.